I'm back with my 2nd card today and it's time for a new challenge over at As You Like It. For this fortnight we would like you to showcase a project showing your favourite animal. I have to say my favourites are dogs. We have two of them and they are so loving and loyal, but I must say they sometimes drive my hubby mad because they follow him everywhere! I have used the cute MFT Happy Pawlidays stamp set. I've had the set for ages, but it's the first time it's been used. I've coloured with copics, made an attempt at masking and used a Joanna Sheen holly edger die. I hope you will be able to join in and you can see the fabulous inspiration from the rest of the DT if you pop over here. Thank you for visiting and I hope you have a lovely weekend. This is the first of 2 posts today. I was pleased to be asked by Jo at C.R.A.F.T. 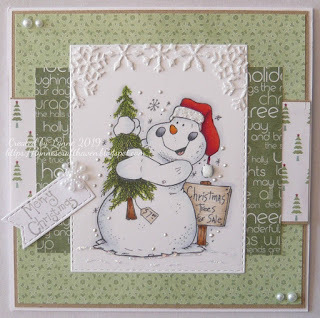 to be a Guest DT and this is my card for the challenge which is all about Christmas. 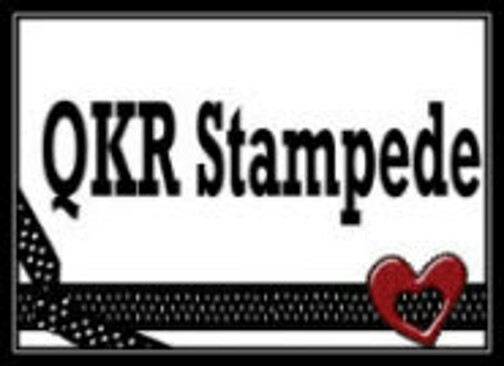 I have used this cute image from one of the sponsors, QKR Stampede. I have coloured him with copics and used papers from an old LOTV pad. I've added my favourite mini snowflakes to the top of the image and added pearls and a sentiment, also from LOTV. with prizes of digital images for the lucky winners. Thank you for visiting and I will be back very soon. 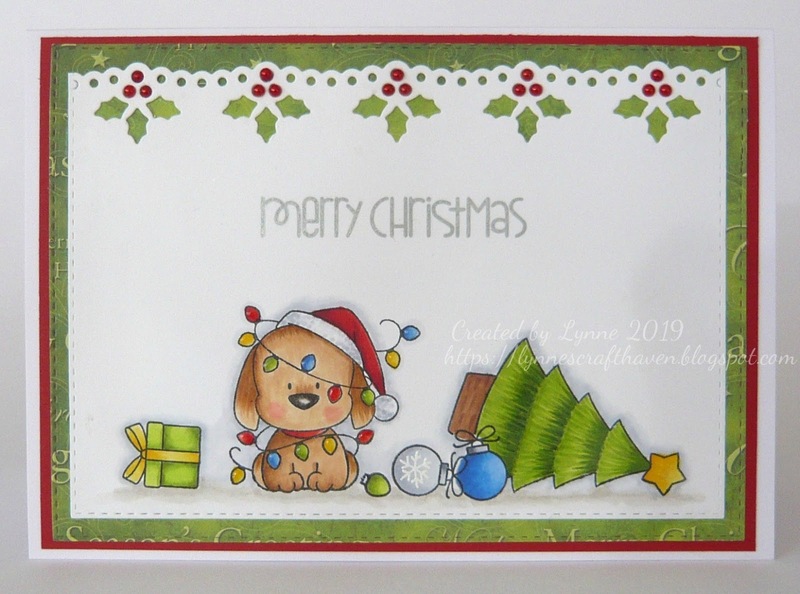 It's the 1st day of the month and time for a new challenge over at Sparkles Christmas and the theme this month is "Feature a Creature". 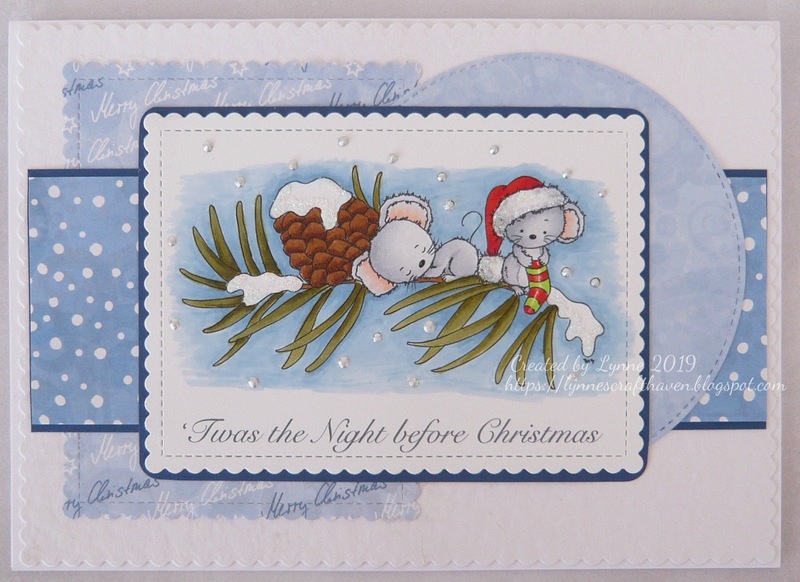 For my DT card I've used this cute image from Di's Digi Designs, coloured with copics. All the blue papers are from my Christmas scraps box and from the same pad too which is Frosty Christmas by LOTV. The sentiment is computer generated. We'd love you to join in this month and you can see the rest of the lovely DT inspiration here. Have a good week all and thank you for taking the time to visit. 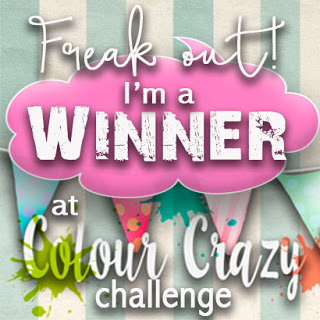 I'm back again, this time with a card as a Guest DT at the Colour Crazy challenge. This is an Anything Goes challenge as long as there is some hand colouring on view. 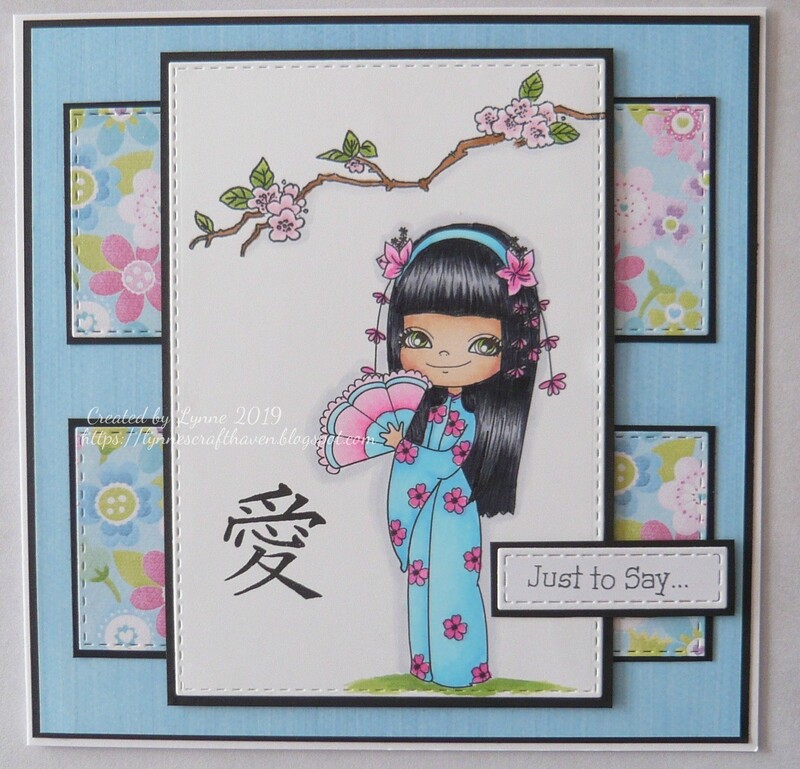 The sponsor is Little Blue Button stamps and I have used their Sweet Geisha Charlie kindly provided for the DT. I have coloured her with copics and also stamped a branch and a Japanese symbol from an old LOTV stamp set. The papers and sentiment are also from LOTV. If you'd like to join in this fortnight and also see the inspiration from the rest of the DT you can pop over here . I hope you all have a good weekend and that any mothers here in the UK get spoilt rotten on Mother's Day. There's a new challenge over at As You Like It and for this fortnight we would like you to showcase a project using your favourite colouring medium (and don't forget to say why it's your favourite please). I always use copic markers. These are the first pens I used when I started colouring and even though I've tried pencils I always go back to the copics, I suppose it's because I'm more familiar with them and find them quicker to use. 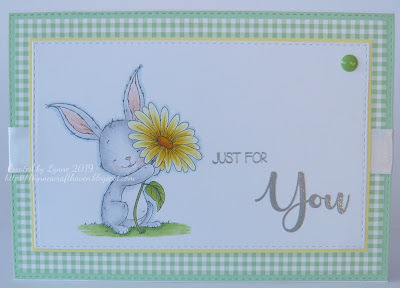 For my card I've used the cute Bunny Holding Flower kindly provided by our sponsor, coloured with the aforementioned copics. This is a fairly cas card for me, but I'm pleased with the way it's turned out. I've embossed the sentiment from LOTV in silver and used yellow and green card to go with the image. A strip of white ribbon breaks up the gingham a bit too. I hope you can join in this fortnight and if you'd like to pop over to the challenge you'll be able to see the wonderful inspiration from the rest of the DT. Thank you for taking the time to visit and I hope you can leave a comment, I do love to read them. It's time for a new challenge over at Christmas with the Cuties and the theme is White on White. 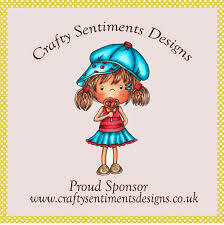 For my card I've used an image from our sponsors, Crafty Sentiments Designs. I must admit it's quite difficult to have a totally white on white card when you have an image to colour, but I've tried to keep the colours as pale as possible and used light teal and grey copics. I've added white glitter to the band on his earmuffs and extra snowflakes too. A Creative Expressions sentiment, Joy Crafts snowflake border and three little pearls finish it off. The sentiment has had sparkle pen added, but as usual you can't see this on the photo. 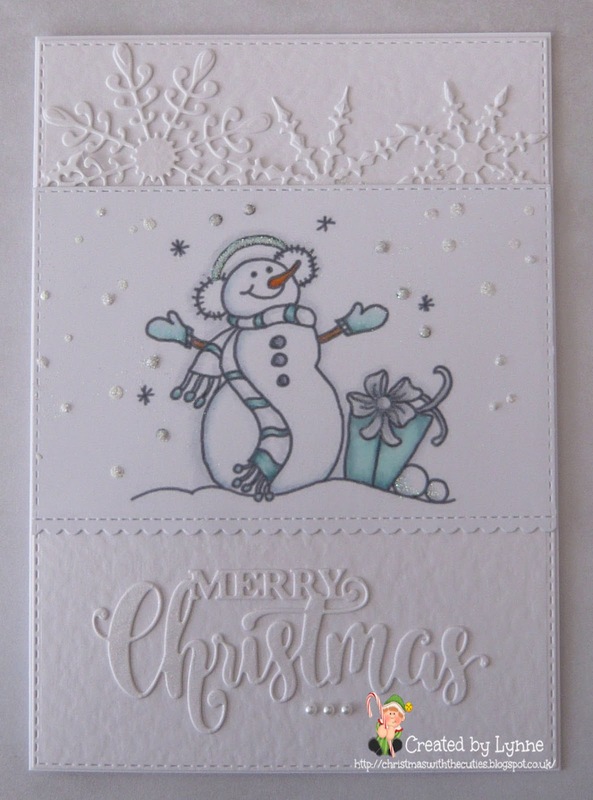 I hope you can join in and make a start on those christmas cards following the theme of cute christmas and white on white. Thank you for visiting and I do appreciate it when you leave a comment, thank you. 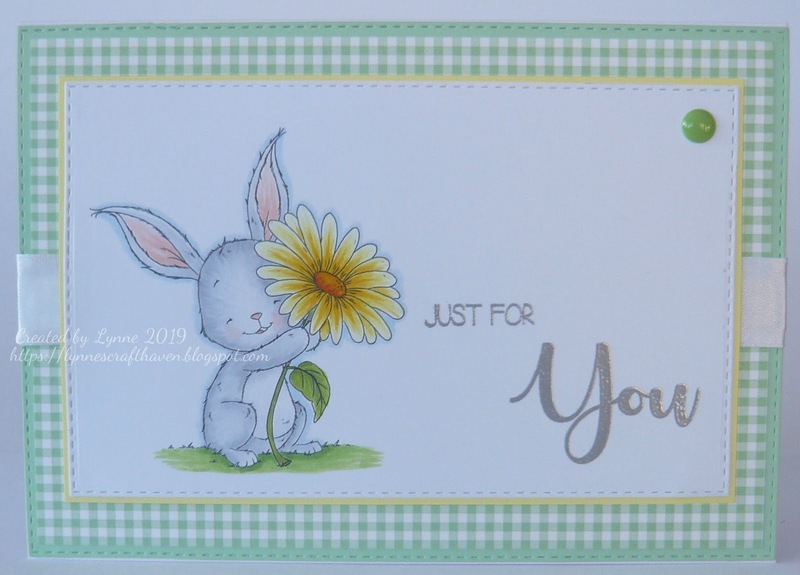 It is time for a new challenge at As You Like It and this fortnight the theme is "Dies or Stencils", which do you prefer? My favourite is definitely dies. 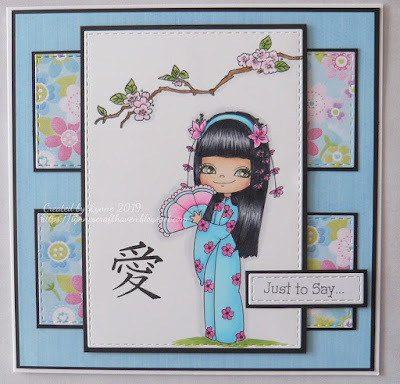 I use them a lot on my cards and I especially like the stitched edge dies as they finish a card off really well and dies also make it very easy to add interest to a card. 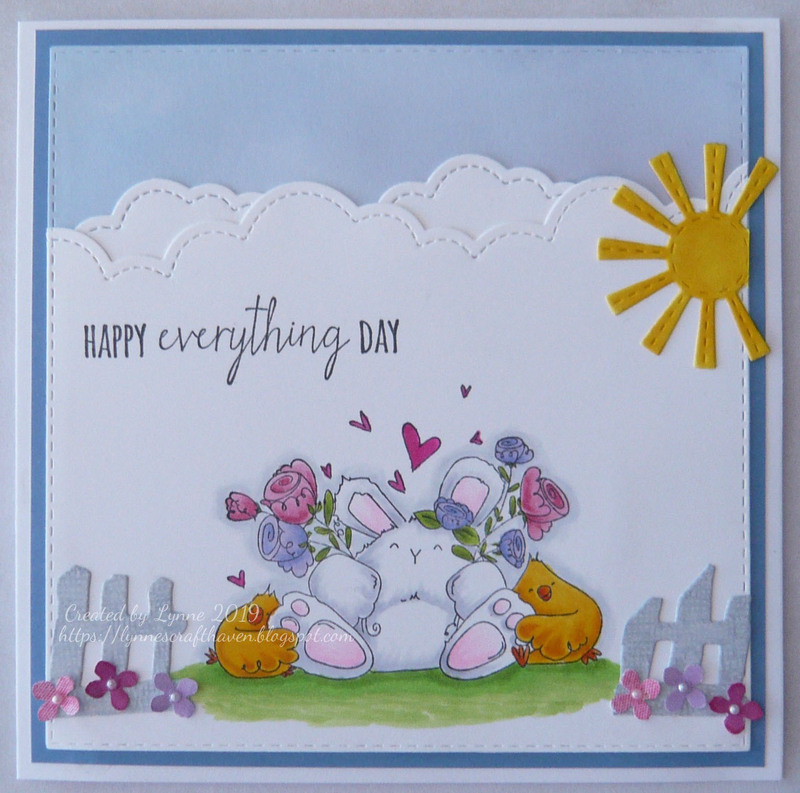 For my DT card I have used a Stamping Bella stamp called Happy Everything coloured with copics. 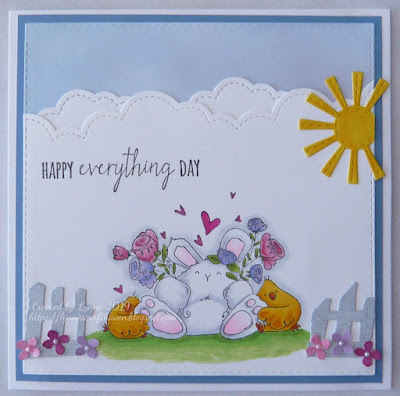 The dies I have used are Lawn Fawn puffy clouds border, a Whiff of Joy fence die and also a sun die. The little flowers added to the fence are from a Martha Stewart punch. 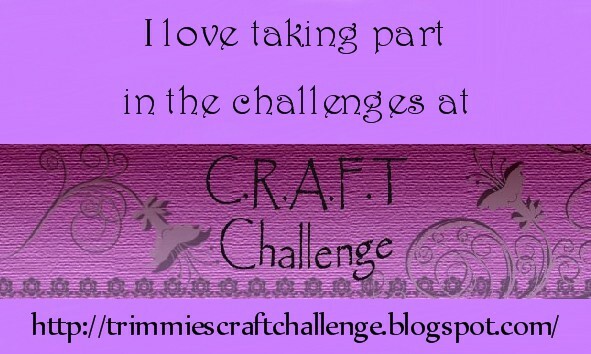 We would love you to share your creations for this challenge and the sponsor this time is Crafty Ribbons with a lovely prize for the lucky winner. Have a good week and I hope you haven't suffered any damage in the winds this week. I live with my lovely hubby and two little Cavaliers. I have gone through various craft phases over the years including dressmaking, embroidery and cross stitch, but have only been making cards since 2015 and have been addicted ever since!